Months supply of inventory rises to 2.5, the highest since January 2012. Median closed sales price is flat from a year ago. 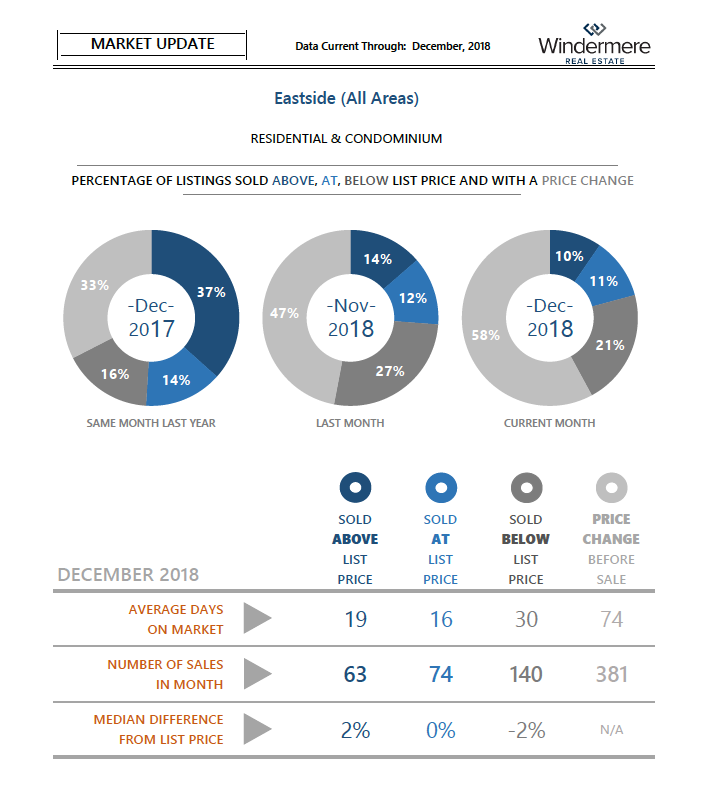 Eastside residential only, is down 3% from a year ago. Of the properties that closed in December 2018, 58% had price changes from their original list price. December pending sales were down 11% from prior year. July through November sales were off 20+%. Early indicator that buyers may be ready again. Interest rates have dropped 1/2 a point in last two months. Seattle job hiring is up 1.2% from a year ago according to LinkedIn. May and June 2018 new listings taken were the highest two months in over ten years (1,806 + 1,619). June 2018 active inventory was 1,527, the highest since August 2015. Interest rates increased from 3.95% in December 2017 to 4.57% in June 2018. Second half of 2018 pending sales were 79% of 2nd half of 2017 (4,829 vs 6,145 or missing 1,316). First half of 2018 pending sales were 97% of 1st half of 2017 (6,236 vs 6,436 or missing 200).